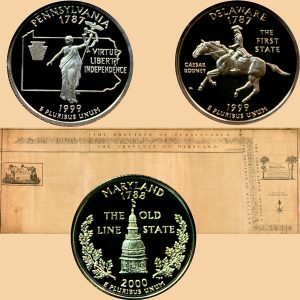 Today, the Maryland, Pennsylvania and Delaware State Quarter Coins remember when the commissions from Pennsylvania and Maryland met on November 19, 1760 to begin drawing the boundary lines which became the basis for the survey by Mason and Dixon. The year 1760 stands out as an important epoch in our story. Frederick, Lord Baltimore, had long grown tired of the fight which, it appeared more than probable, would again be decided against him. He consequently entered into an agreement with the Penns on July 4, 1760, accepting as a basis the articles already drawn up in 1732, and afterwards set forth in the Chancellor’s decree of 1750. The twelve-mile radius from New Castle was measured horizontally, and the line across the peninsula from Cape Henlopen to the Chesapeake was drawn to the full length of sixty-nine miles, two hundred and ninety eight perches, as was originally claimed by the Pennsylvania commissioners in 1751. The articles of agreement are most minute in every detail, and occupy thirty-four printed pages in the Pennsylvania Archives. The boundaries of the lower counties were thus practically settled in their present form. To carry the agreement into effect, commissioners were appointed on both sides, those for Maryland being Governor Sharpe, Benjamin Tasker, Jr., Edward Lloyd, Robert Jenkins Henry, Daniel Dulany, Stephen Bordley and the Rev. Alexander Malcolm, and those for Pennsylvania being Hon. James Hamilton, William Allen, Richard Peters, Benjamin Chew, Lynford Lardner, Ryves Holt and George Stephenson. They met at New Castle on November 19, 1760, and at once began to draw the boundary lines. They undertook the work and carried it out successfully, finishing their task in December, 1767. It was thus that the boundary between Pennsylvania and Maryland came to receive the famous name of the Mason and Dixon’s line. “We have completely run out, settled, fixed and determined a straight line beginning at the exact middle of the due east and west line mentioned in the articles of the fourth day of July, one thousand seven hundred and sixty, to have been run by other commissioners formerly appointed by the said Charles, Lord Baltimore, and the said Thomas Penn and Richard Penn, across the peninsula from Cape Henlopen to Chesapeake Bay, the exact middle of which said east and west line is at the distance of thirty-four miles and three hundred and nine perches from the verge of the main ocean, the eastern end or beginning of the said due east and west line; and that we have extended the said straight line eighty-one miles seventy eight chains and thirty links up the peninsula, until it touched and made a tangent to the western part of the periphery of a circle drawn at the horizontal distance of twelve English statute miles from the centre of the town of New Castle, and have marked, described and perpetuated the said straight or tangent line, by setting up and erecting one remarkable stone at the place of beginning thereof, in the exact middle of the aforesaid due east and west line, according to the angle made by the said due west line and the said tangent line; which stone, on the inward sides of the same facing towards the east and towards the north, hath the arms of the said Thomas Penn and Richard Penn graved thereon, and on the outward sides of the same, facing towards the west and towards the south, hath the arms of the said Frederick, Lord Baltimore, graved thereon; and have also erected and set up in the said straight or tangent line, from the said place of beginning to the tangent point, remarkable stones at the end of every mile, each stone at the distance or end of every five miles being particularly distinguished by having the arms of the said Frederick, Lord Baltimore, graved on the side thereof turning towards the west, and the arms of the said Thomas Penn and Richard Penn graved on the side thereof turning towards the east, and all the other intermediate stones are marked with the letter P on the sides and with the letter M on the sides facing towards the west, and have fixed in the tangent point a stone with the arms of the said Frederick, Lord Baltimore, graved on the side facing towards the west, and the arms of the said Thomas Penn and Richard Penn graved on the side facing towards the east. “2d. That from the end of the said straight line or tangent point, we have run out, settled, fixed and determined a due north line of the length of five miles one chains and fifty links to a parallel of latitude fifteen miles due south of the most southern part of the city of Philadelphia, which said due north line intersected the said circle drawn at the distance of twelve English statute miles from the centre of the town of New Castle, one mile thirty-six chains and five links from the said tangent point, and that in order to mark and perpetuate the said due north line, we have erected and set up one unmarked stone at the point where the said line intersects the said circle, three other stones at a mile distance from each other graved with the letter P on the sides facing the east, and the letter M on the sides facing the west, between the said place of intersection of the said circle and the said parallel of latitude, which last stone on the sides facing towards the north and east, hath the arms of the said Thomas Penn and Richard Penn graved thereon, and on the sides facing towards the south and west hath the arms of the said Frederick, Lord Baltimore, graved thereon. The fourth section goes on to describe the running of the east and west line, which forms the boundary for the north of Maryland and south of Pennsylvania. This line was carried to a distance of over two hundred and eighty miles, when the Indians prevented them from proceeding, and it was afterwards carried to its present length. So far as the lower counties were concerned, this terminated the border troubles, but in the northeastern counties of Maryland, and the counties in Pennsylvania adjoining them, occasional riots were still heard of at long intervals. John Penn had occasion to complain, in 1769, of Cecil County ruffians who had committed outrages in Pennsylvania, and even as late as 1774 the entire trouble had not been smoothed over. The outrages of earlier times had ceased, however, and what misunderstandings now occurred were of a peaceable nature, and grew out of attempts to settle the details of the dispute beyond all cavil. The final proclamation of the Governor of Pennsylvania announcing the completion of the work was not issued until April 8, 1775. The Maryland, Pennsylvania and Delaware State Quarter Coins show with an image of the preliminary boundary map of 1768 that became known as the Mason-Dixon line.